HÀ NỘI — Artists from the Faculty of Arts Teaching at the Vietnam University of Fine Arts have organised an exhibition that is being held at Exhibition House on 29 Hàng Bài Street. 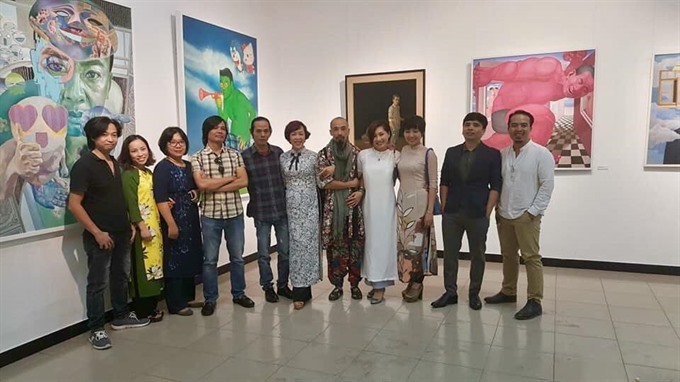 20 Năm Sư Phạm Mỹ Thuật Yết Kiêu (20 Years of Yết Kiêu Arts Teaching) celebrates the 20th anniversary of the establishment of the faculty and features 60 works by over 50 former students, many of which have won prizes at domestic and international events. According to Chu Anh Phương, the dean of the faculty, the event was a rendevouz for the artists and art enthusiasts to share their passion and feelings, and also an opportunity for the former students of the faculty to recollect their memories of studying and creating art together. “The 50 participating artists represent the whole spirit. Each of them has their own style of expressing the artists’ affection for life and art,” Phương said. “Holding different postions, the artists share the same passion and love for their careers as well as pride for the university where they used to study and grew up. The exhibition is also a chance to review the path they have taken before making their contributions to Việt Nam’s fine arts,” he added.